Buying replica watches online is not that easy! This is because there are so many online fake stores out there and every one of them tempts us with offers, discounts and gorgeous new imitation watches. And let’s not forget that trusting a company you do not know isn’t easy at all. So how do you decide if a replica watches website is trustworthy or not? Well, if you read the below review of Alshwatches.com you will learn that there are many indications towards the legitimacy of a fake watches website, things that will tell you if it is safe to shop its imitation watches or not. All the available replica watches brands are displayed in a left side menu bar which I must say it is quite long. There are so many luxury watch names here that you won’t believe your eyes. What I also noticed is that each category includes just a few items, ranging from 3 to 377 models. The collections are not that wide or varied. Maybe this is all for the best as the website does not feature a filter or advanced search option so you can sort the products. In order to find a particular model that you want to buy you just need to browse page by page. These replica watches are quite affordable. The company only sells Japanese made knockoffs and the prices are about 70-90 USD. This is surely a very reasonable price if we consider the fact that the watches are simply imitations that are mostly made to look as the authentic watches while the inside movement is only an average Asian mechanism. The description page is very detailed and it manages to mention basically all the important specifications of these replica watches. Things like movement, materials, markings, design, weight and size are thoroughly explained. Alswatches.com says that it usually uses EMS and Air Mail for dispatching the orders, but if needed they will also send by TNT or UPS. The shipping fee for EMS and Air Mail is $20, but it does not say how much it is for TNT or UPS. This cost will be calculated only when you request it and it depends on the destination country and weight of the package. The estimated delivery time for EMS is 5-10 business days, while for TNT or UPS is about 4-7 business days. All packages are shipped with a tracking number that you can use to follow the progress of your delivery. The company provides a 14 days exchange policy. This policy can be applied if the items that you have received are totally different than what was ordered or if the products have a quality defect. If you wish to return the items for a refund this is also possible, but you must be aware of the costs of this process: the return fees are yours to pay, a restocking fee, plus, the initial shipping fee will be deducted from the refunded amount. It does not say anything about a repairs fee. What happens after the first 14 days? If the watch breaks afterwards what options do you have? 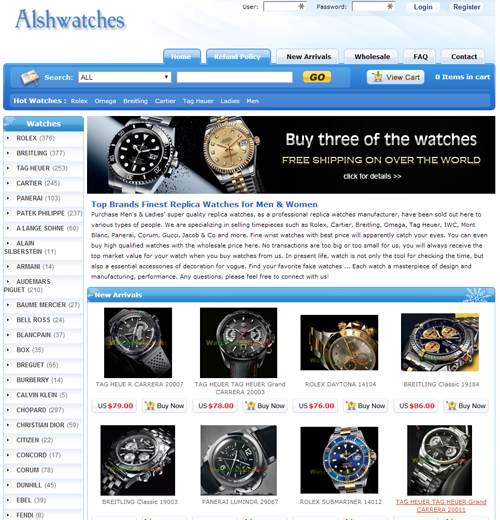 Alshwatches.com has a very familiar look and this isn’t because they have invested a lot of time and effort into designing a user friendly and appealing website, but rather because I have definitely seen this template numerous times before at other online replica stores. The thing is that this design isn’t even that good. It is a common white and blue template with two menu bars, a large text section and a sponsored products part. It just does not have a very professional and elegant look. On the website it is clearly stated that the accepted payment options are: Visa, Mastercard and Western Union. Yet, the only available payment method that we see after Checking Out is VISA. My experience in dealing with online replica merchants have thought me that you shouldn’t believe everything you read on their site, you should test it and order only after confirming it. I find that lying about the most important aspects of your business is highly unacceptable and this shows how untrustworthy you really are as a company. Pictures: The pictures are obviously copied from numerous different sources. It is almost impossible to find on this website two products that have images that share the same photographic style. These all seem to be catalog photos copied from the original company’s website. I am very much against replica companies that do such a thing. How can we trust that the company is really legit, that it has a valid business and that what we see on the website is what we will get? This is if we ever get anything because it may very well be a scam. And on top of all, the pictures are watermarked with a different name: WatchesSell.com, a website that has been shut down. Customer service: Customer service is one of the most important things you need to consider when you are ordering replica watches online. Why is that? Because you must be sure that if things go south, you can contact the company and ask them to help you receive your order or exchange it if you have received a defective or different product. For this the merchant needs to be reachable by phone, email or chat. Unfortunately, Alswatches.com can be contacted only by email at [email protected] which is an unsafe Gmail account. The company does not support phone or live chat. Summary: Alswatches.com is one of those replica watches companies that do not care about looking professional or about providing high quality services to its customers. When you are ordering replica watches online it is very important to buy from a website that uses good quality pictures which represent the actual merchandise, to provide excellent and friendly customer service and to avoid misleading or lying its customers about the way it conducts its business. Unfortunately, Alshwatches.com does not fulfill any of the above requirements we, online shoppers, have for a trustworthy replica merchant. And for all these reasons I feel like this is not the right place where watches aficionados should risk their money in their quest of buying a good quality replica watch. This company is a total nightmare. It took them over 3 weeks to ship something that was needed for a month-long job (I didn’t need it after that month). When I replied to the email saying they were “getting ready to ship it” more than 3 weeks in, they told me “try to understand it already shipped now” (it hadn’t). When my women’s watch arrived, it was a GIANT men’s watch. I have exchanged close to a dozen emails, each demanding I “try to understand” all of the ways that they will not exchange it, will not answer whether or not they actually even stock the women’s watches they advertise, and certainly not with an RA number or anything that will allow me to return the item with any confidence that it won’t just fall into a black hole. They are rude, unreliable, and may not even sell what they advertise. I have contacted the BBB who referred me to the American Consulate in Shanghai who referred me to the local police – all a bit much for a simple watch exchange, right? Yet, I still have no answers other than the fact that I “must understand” why I paid over $100US for a giant men’s timepiece I cannot use or seemingly return. DO NOT BUY FROM THIS COMPANY – MIGHT AS WELL FLUSH YOUR $$ DOWN THE TOILET. I ordered a watch on the 2014-05-24 and still didn`t got it yet. and all other variations of the Puretime Watch company ([email protected]). I have just been conned and scammed by Dong Yan Jie, Angus, Nikki Chen and the rest of the staff at Puretime watches, and I want to warn anyone else who is considering buying a watch from them – PLEASE DON’T! I am a private person living in Britain and a little while ago I decided to buy a replica watch. I spent several months reading every replica watch review site on the net and a litany of other internet articles, including ones written by some of Britain’s national newspapers. I decided early on to abide by several criteria, one being that I would not pay by bank transfer or Western Union, only by Visa because then I could claim on the card if the company was a scam. Another, that I wouldn’t spend over $250 because several site authors who had bought a cheap and expensive version had been told by jewellers that the two watches were identical. And so using my self imposed rules and everything I learnt from the review sites, I whittled out the more unscrupulous replica watch sellers, but I became disillusioned over how impartial these ‘reviewers’ actually are as most stick to one Chinese company and its subsidiaries and condemn all others. Anyone can say what they want about themselves if they are paying for an advert or if they are perhaps, incentivising a reviewer. So in the end I found myself going back to several replica watch forums especially “rwgforum.net”, “rwg.biz” and RWI forum. These are every day, unbiast replica watch enthusiasts and so I felt that anyone they recommended would be based upon real experiences. So I spent hours everyday on this site, in particular reading everything ever said about Puretime, Angus, Dorris and Nikki Chen. I noted that yes, there were many bad reports of where transactions had gone wrong, there were numerous postings of clients unhappy with the quality of Puretime watches… BUT the company and its owners were also praised repeatedly by the regular forum members. They seemed to love Puretime watches and all the actual members had good experiences. I didn’t dismiss the many complaints I’d read, but Puretime had seemed to explain some of them away (in ‘replies’) or simply accused the complainers of being “rival companies out to slander them”. Many forum members agreed. Wow, I regret that decision. I emailed Angus and begged to be allowed to pay by card. He said no. In hindsight, I should have asked myself why he can’t take Visa when so many fake watch companies can… the only answer would have been; because Puretime and Angus (Dong Yan Jie) has committed fraud, conned the Visa payers, and after those customers got refunds from Visa, Visa stopped allowing Puretime to use their facilities! I was reluctant to break my own rule about only paying by Visa, but the high praise of the forum members kept ringing in my ears. And so my nightmare began. I chose a watch that was far more expensive than I’d intended to spend (again, I felt that I couldn’t lose as I could see forum members discussing and praising Puretime’s better, more expensive models), and I went to Nat West bank and transferred $750 plus fees to Dong Yan Jie at Puretime (Industrial and Commercial bank of China, Laioning Provincial Branch, Gold Star Hotel, Floor 3). That was on the 13th June 2014. I sent it 2 day transfer and eagerly waited for the quality control photos. None came. Dong Yan Jie and Puretime continuously told me that the “money had not come”, but added it was “OK and that I was to be patient and the money would arrive”. 4 weeks went passed with Puretime fobbing me off and making excuses and swearing the money hadn’t arrived. I scanned and emailed them all the Nat West documents, showing the account name, account number and swift/bic number etc. Puretime didn’t acknowledge them and continued telling me to ‘wait’. In the end I paid Nat West £25 to do a full investigation into where my money went and a week later they told me they had investigated the payment all the way to China and that it had indeed gone into Dong Yan Jie’s account 6222020707003334851, Swift Bic; ICBKCNBJLNP. They had even been told by the Chinese bank that they money had been withdrawn soon after, and that “similar occurances had happened before, but that was between the sender and the account holder”. My bank were 100% sure that the money had been successfully transferred a month ago and to the right person. And then the told me that I had been conned and that the whole Puretime company was a fraud. I’d lost my money. Now Puretime don’t even bother to reply to my emails, not even to lie and say it’s not been received. And they were never brilliant at it in the first place, never sending more than a one-liner. I’ve lost my money now and realise I’ve been scammed. What was I thinking! As one newspaper article wrote “these replica companies are criminals, pirates who steal brand names – don’t ever kid yourself that they actually care about the quality of what they sell or the people to whom they sell”. And all this makes me wonder about the forum members. Why were they sent “superb quality watches” and why was my money was stolen by Dong Yan Jie? Well, Puretime’s con is quite clever; On their website they say “we made our reputation in the watch forums” and I think that’s correct. They sell decent watches to those ‘in the know’, to those who they can see writing in the forums, to those they know are members, and who are obviously serious about replicas etc. Then, they sell trash quality watches to other, generic buyers who wouldn’t know a quartz from kinetic (which explains the thousands of internet complaints of broken, rubbish quality Puretime watches). And there is also a section of would-be buyers to whom they don’t even send anything, and just steal their money, and I fall into that category. They know that my cries will be drowned out by those vocal forum members who’ve received decent watches. They almost play us buyers off against each other, using the knowledgeable forum members to (innocently) reel us suckers in. The perfect scam. And if one does complain, Angus and Nikki Chen and those who have received good watches will accuse me of being a “libellous rival” or I’ll be explained away as “nuts” or “mistaken” in the forums. And Dong Yan Jie gets another $750 for nothing. And as I said, I’m not the only one. Please, please Google Puretime, pureti.me and all the variations and you will see complaint after complaint (especially if you search using the word ‘scam’). I wish I had listed to those thousands of people rather than to the forum members who got the few ok watches the company sends out. Please don’t buy from this company!! You will lose your money and even if you get a watch, it will be trash! These people are criminals and if they don’t care about breaking Chinese law and stealing brand names, then they certainly won’t care about you! Dong Yan Jie, Nikki Chen and Puretime are a massive con, so be warned! !